Suzanne James – caterers of distinction combines sustainable, seasonal, organic cuisine, with unrivalled passion to create world-class events. Our work is thought provoking, enticing the palette and evoking the senses, creating unique experiences and pioneering culinary masterpieces. It is our mission to spread the word about how exciting sustainable food is, and how it can benefit our client’s events. Trading since 2003, we have been repeatedly recognised for our contribution to catering with a green ethos. Now one of the only catering companies to be recognized by the Sustainable Restaurant Association and with numerous industry awards proving our expertise. We would be delighted to help create the event of your dreams. Party Ingredients are London based private caterers with over 30 years’ of experience spanning State banquets to film premiere parties, award ceremonies to fabulous weddings. We believe in beautifully presented, seasonal food that tastes great and seamless service that showcases the best of British hospitality. For us, these are the fundamentals. We tailor-make each event to suit your exact requirements and we strive to exceed our clients’ expectations, time after time. 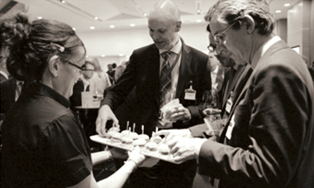 We are delighted to be a recommended caterer at City Centre, one of London’s most unique venues for corporate events. To receive a bespoke proposal, please get in touch with us for a chat. At Cafe Sunlight we create classic dishes with seasonal and local ingredients from producers in Kent who we know and trust. The result is food that is delicious, wholesome and well executed, combined with a smooth and friendly service from people who care about what they are doing. We understand that every event is unique and every client has their own tastes and priorities and we pride ourselves on providing a flexible, helpful and personal service. Cafe Sunlight also happens to be a Social Enterprise that supports individuals to gain employment and training and 100% of our trading profits support charitable activities. So you can enjoy great food and service, with the added benefit of knowing that society benefits. Whether you require simple canapés and drinks or a full day of refreshments and lunch or a more formal dinner we would be delighted to work with you.